On October 27, 2003, the New York Times ran a guest column on its Op-Ed page by David L. Kirp entitled “How Much for That Professor?” The piece, which was about universities spending big bucks to get professors with star power, focused in its opening and closing paragraphs on the case of Niall Ferguson, described as “the most widely discussed and controversial British historian of his generation.” Last winter, New York University successfully recruited Ferguson away from Oxford University with promises of big money and reduced teaching responsibilities. Barely six months later Harvard lured Ferguson away from New York University with an offer of even bigger rewards. Ferguson’s reputation in the United States is derived first and foremost from his book Empire (2002), a work that attempts to present a strong defense of the British Empire during the three centuries of its rule—and goes on to call for the expansion of the American Empire in the present century. 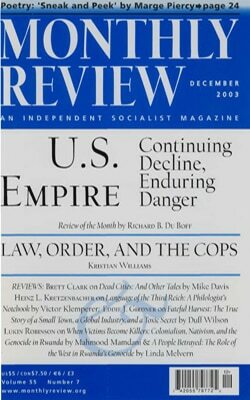 MR readers will already be acquainted with Ferguson from last month’s Review of the Month, “Kipling, the ‘White Man’s Burden’ and U.S. Imperialism.” There he was revealed as one of those present-day proponents of imperialism who argue that the United States should once again take up the “global burden” that history has imposed on it, and, “in the name of liberty,” pursue a course similar to what Kipling urged in his poem “The White Man’s Burden” in 1899 (when Kipling called upon the United States to shoulder its imperial responsibilities by forcibly occupying the new Philippine Republic) (Empire, pp. 369–70). Ferguson’s Empire shows he is ready to go to almost any length to defend Britain’s past imperial glory and its historic role as the “begetter” of “the empire that rules the world today” (Ibid.). After a very slighting fourteen-line presentation of John A. Hobson’s critique of imperialism in his Imperialism: A Study (1902), in relation to which Ferguson misleadingly quotes from a criticism that Hobson leveled against financiers, he immediately turns to Hobson’s contemporary, the openly anti-Semitic Henry Noel Brailsford. According to Ferguson, Brailsford “took Hobson’s argument further” by writing of “the shrewd features of the Hebrew financier.” Ferguson then informs us that, “Like those modern conspiracy theories, which explain every war in terms of oil reserves, the Radical critique of imperialism was an oversimplification….And like those other modern theories that attribute sinister power to certain financial institutions, some anti-imperialism conveyed more than a hint of anti-Semitism” (pp. 280–82). Hobson’s influential critique is thus placed by means of pure insinuation within a universe of radical conspiracy theories and anti-Semitism—reaching down to the present day. In all of this no mention is made of the fact that Hobson was one of the great anti-jingoistic, antiracist thinkers of his day. Such no-holds-barred ideological work on behalf of the forces of empire has made Ferguson a much sought after pundit—one who can be read regularly in the Financial Times and the New York Times or heard on National Public Radio. Now that he is ensconced at Harvard, Ferguson’s advocacy of American imperialism, on the model of an earlier—and he claims successful—British imperialism, is likely to become even more pronounced. That stance was, of course, what made him so extremely valuable to the system in the first place. Such a professor is well positioned to demand a very high price indeed. We would like to alert our readers in the New York City area to an important conference, “Race and Labor Matters,” December 4–5 at the City University of New York Graduate Center, 365 Fifth Ave. The conference will bring leading labor scholars and trade union activists together to discuss a range of issues including: affirmative action, immigration, labor-community relations, diversity, globalization, anti-racist union efforts, union democracy, gender, and possibilities for social change. Speakers will include Manning Marable, Juan Gonzalez, Robin D. G. Kelley, Roger Toussaint (president of TWU Local 100), Gerald Horne, Bill Fletcher (president of TransAfrica Forum), and Frances Fox Piven, to name just a few. For more information visit the web site: www.raceandlabor.org or call Nancy Weyandt at (212) 966-4248, ext. 218.